MANDOLIN. BLUEGRASS. 11 - 42. LOOP-ENDS OR BALL-ENDS. A choice of phosphor or nickel round wound strings on a hex steel core. 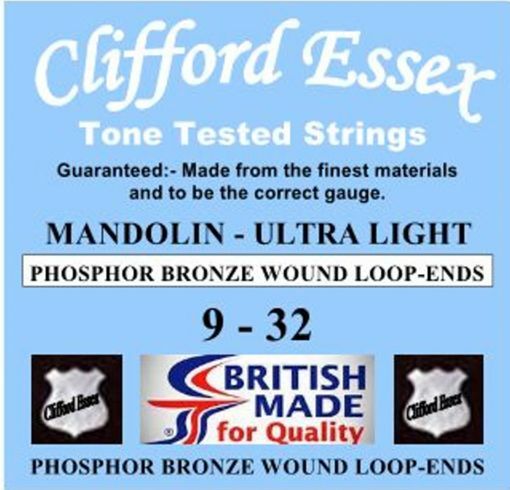 Our phosphor bronze wound strings are acclaimed throughout the world for their warm, bright, long lasting tone, they are ideal for the acoustic mandolin. Our nickel round wound strings are well known for their strong magnetic properties, very bright tone and projection, ideal for the electric mandolin. Our sets make up of the most popular gauges, with a choice of ball-ends or loop-ends. If you prefer to make up your own sets, please go to our single string section. Order 3 sets and receive a 10% discount. If you do not require 3 sets, tick 'No Thanks' in the options box. MANDOLIN. MEDIUM GAUGE. 11 - 40. LOOP-ENDS OR BALL-ENDS. MANDOLIN. HEAVY GAUGE. 12 - 42. LOOP-ENDS OR BALL-ENDS. MANDOLIN. LIGHT GAUGE. 10 - 34. LOOP OR BALL-ENDS. MANDOLIN. ULTRA LIGHT GAUGE. 9 - 32. LOOP-ENDS OR BALL-ENDS.